We served it on a bed of fresh mung sprouts and coriander leaves, but radicchio and frisée would also be perfect as their crisp bitterness would offset the sweeter berry and beet flavours beautifully. I happened to have some dried cranberries; you could go for fresh, or of they are too sharp for you go for pomegranate seeds or maybe even blueberries. This is not a quick recipe, though; take note of that if it is to be part of a multicourse meal. You can, however, make the feta in advance because that's the part that takes the longest. Patiently skinning a bowl of soaked almonds is a labour of love. But when they are transformed into sharp, salty feta and warmed until slightly crisp at the edges.... trust me; it's worth it! 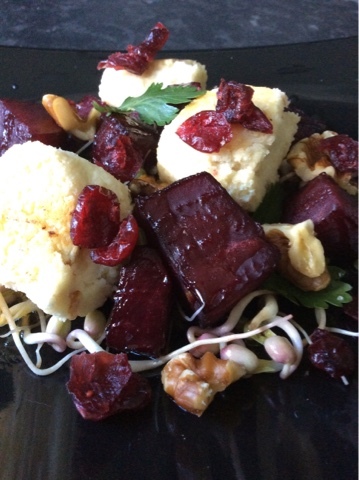 Make the almond feta and leave it in the fridge to firm up a little. Meanwhile, peel and dice the beetroot. Cook it in minimal water, so that all the water s absorbed by the time the beetroot has softened. Prepare the dressing by shaking everything together in a jar. 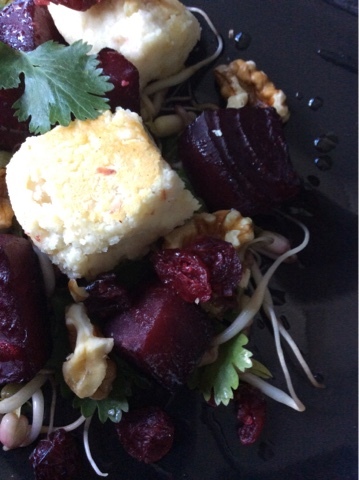 To assemble the salad, arrange the beetroot, feta and walnuts on the leaves/ sprouts. Sprinkle with dried cranberries and spoon over the dressing. 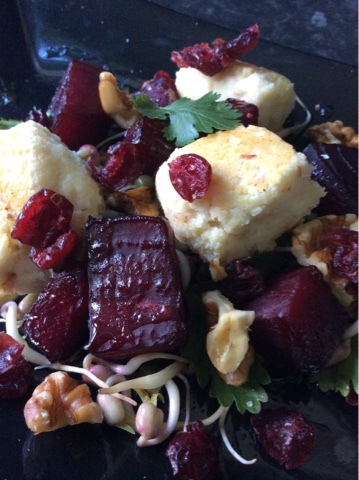 Serve while the beetroot and feta are still warm. ... We haven't decided what our Christmas dinner will be yet, but we will have Christmas cake, Christmas pudding and probably a batch or two of mince pies. What are your culinary plans for the upcoming holidays? What Christmas recipes would you like to see here?